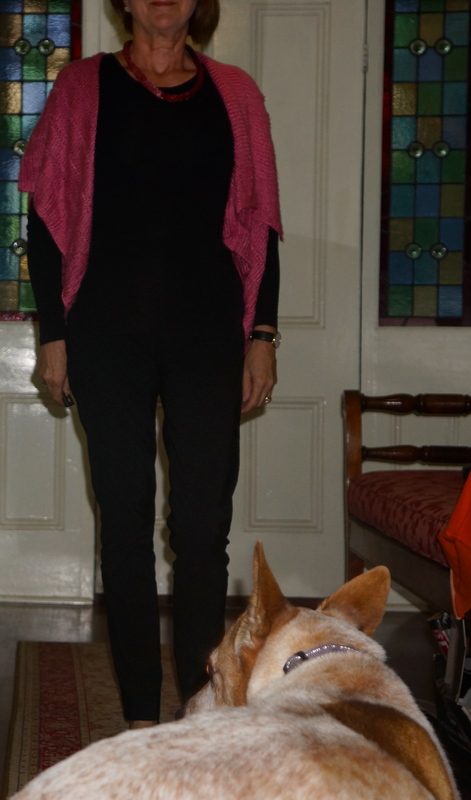 I am wearing the Endless Knitted Cardi Shawl by StitchDiva today (see http://www.stitchdiva.com/knit-crochet-patterns/endless-knitted-cardi-shawl). I knitted it a couple of years ago from some divine Debbie Bliss silk and haven’t worn it nearly enough. I am back in love with it. 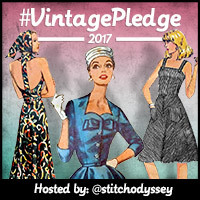 I also have a wool version, but it doesn’t quite drape as well – but I will be boring you all with it before the end of May! This cardi shawl can be worn in a myriad of ways, but this is the way that shows off the beautiful back detailing properly. It can also be worn upside down and pinned in lots of ways to create interest. This is the only shot I got of it upside down and the dog photobombed me (and I cut my head off)! You get the idea though. The lovely detail at the back where all the edges meet gets a bit lost, but it is still quite nice. For MMM’13 I am wearing the Elle pants and Susan top from StyleArc, the endless knitted cardi shawl, my button/magnetic pin, and machine knitted necklace. Not a bad effort. The pin is clearer here, and I show it in detail on this blog page. My necklace was machine knitted in a long tube out of a mixture of different threads – some metallic, plus a bit of embroidery floss to make it soft. I then rolled it on my leg to make it rounded and sewed up the ends. It is just long enough to get over my head, so there are no fastenings. This is a good stashbuster of embroidery yarn. 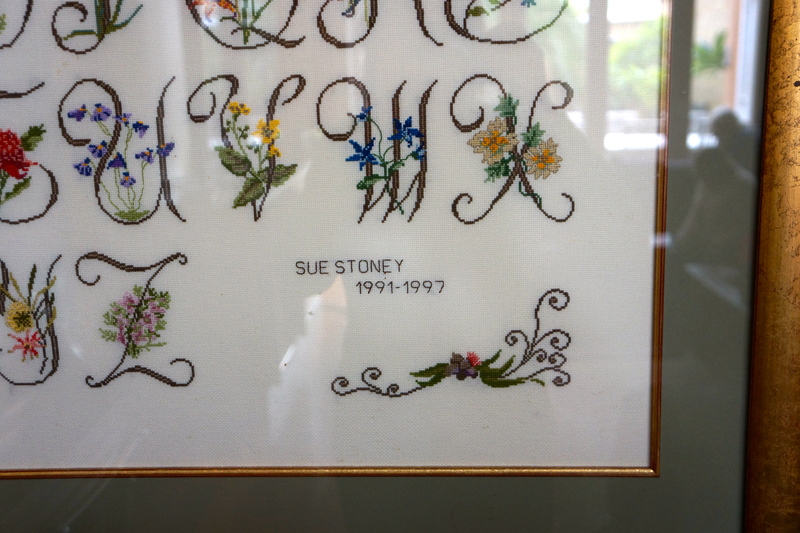 Speaking of embroidery, I thought I would show another creative endeavour of mine, albeit one I did a long, long time ago. 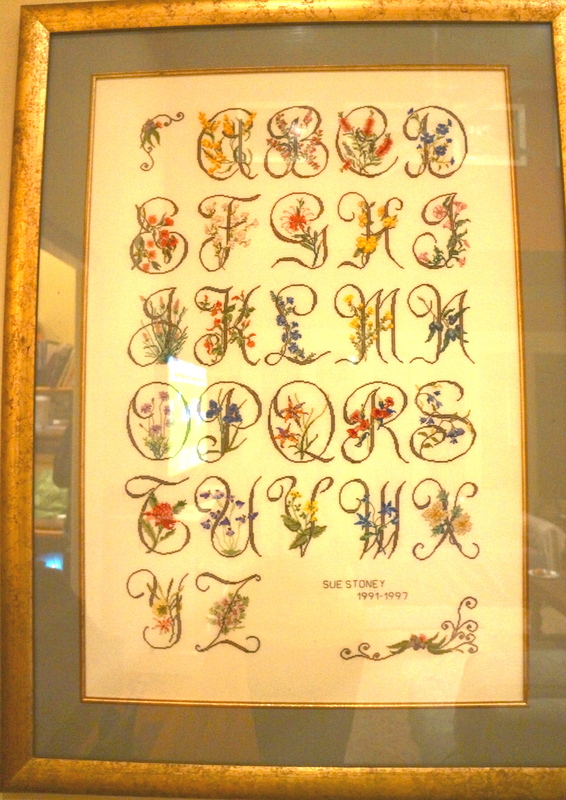 For some unknown reason, I decided in 1991 to cross-stitch an alphabet. Maybe I thought I would use it to teach Tom the alphabet (he was one when I started it, and knew his alphabet by the time I had finished it!!). Anyway, I did this thing. It took so much effort that when the time came to frame it, I insisted on spending a lot on the frame, and it now has pride of place in our family room. You will note the signature line – one of my friends told me that in 100 years someone is going to think this was done by an extremely able child who died when she was six! It is almost impossible to get a photo of it without all the reflection. I can just see my Dad sitting in his wheelchair by the window reading his Kindle in this image above. This is the whole canvas. It is quite large, which is my excuse for taking so long to do it. Apologies for the poor quality of the photo. This looks fantastic. Which Debbie Bliss yarn did you use as I would like to make one as well. Pure Silk DK. I think it might be discontinued – I bought mine in Brisbane heavily discounted :). However, any silk double knit will do it.